Nonnuclear submarines use batteries for power when submerged. (a) Find the magnetic field 50.0 cm from a straight wire carrying 1200 A from the batteries to the drive mechanism of a submarine. (b) What is the field if the wires to and from the drive mechanism are side by side? (c) Discuss the effects this could have for a compass on the submarine that is not shielded. None, since the field directions from each wire are opposite. 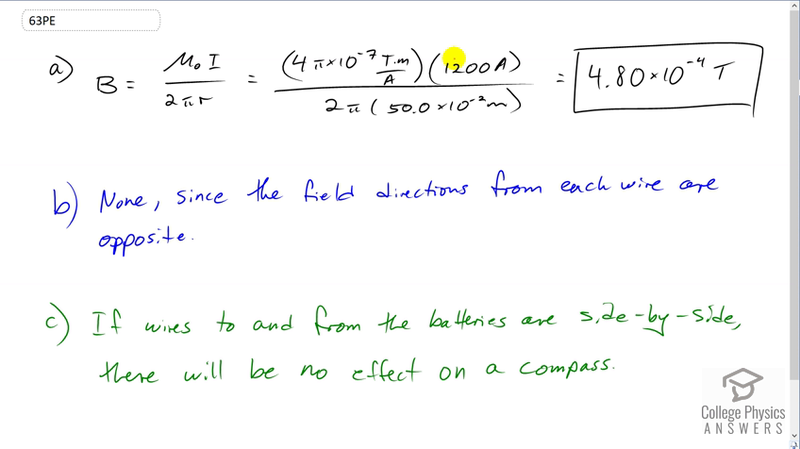 If wires to and from the batteries are side-by-side, there will be no effect on a compass. This is College Physics Answers with Shaun Dychko. We're asked to find out what magnetic field is created by a current-carrying wire in a submarine that is non-nuclear so it has batteries in it. When it's underneath the water it has to run using batteries. There will be a current of 1200 amps coming out of the battery and what's the magnetic field 50 centimeters away from a wire with that current? So we multiply the permeability of free space by the current, divide by two pi times the distance from the wire, 50 times ten to the minus two meters. This gives 4.80 times ten to the minus four Tesla. Now, if the wires are going in opposite directions, carrying current in opposite directions -- so I suppose we have wire like, two wires side by side. This wire is carrying current away from the battery and then this one carries the current back to the battery. These wires will produce magnetic fields in opposite directions. So the magnetic fields will cancel. So there'd be no net magnetic field when you have the wires side by side like this. With the wires side by side, answering part C there will be no effect on a compass inside the submarine. But if you had the wires go along one side of the submarine from the battery and then back along the other side, then these wires are so far apart their opposing directions of their magnetic fields would no longer cancel. There would be an effect but of course, that's not how they would design it. So they're going to put wires to and from batteries side by side so that the magnetic fields from them cancel.